The sweet smell of blossoms are heady in the air and the first sun-kissed days of the new season will soon roll in: plenty to snip in the garden before the spring revival. 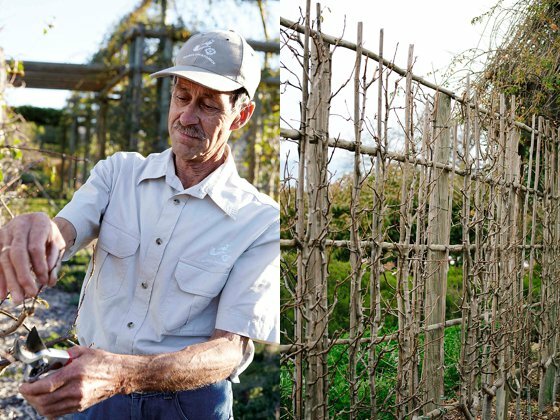 This time of year your nifty gardener focuses on pruning, and our Edward Scissorhands at Babylonstoren is Anton Roux. You’ll find this master of secateurs here every Wednesday and Thursday, skilfully snipping away. Oom Anton, as he is known here on the farm, has the vital job of operating on our fruit trees – he propagates, grafts, plants and prunes the various espaliered fruits and berries in the garden. Anton grew up on a fruit farm in scenic Grabouw, and followed in his father’s footsteps in the export fruit industry. His fascination with exotic fruit took him on adventures around the world. From Brazil, Colombia, Argentina, India and Ecuador he brought back and cultivated tree tomatoes, custard apples and pepino melons to grow in African soil. This young 76 year-old is an example to us all, and epitomises what gardening is about: passion, diligence and – Yah! – patience. He prunes and shapes espaliered trees 12 months of the year – most of his creations take 3-6 years to train into beauties. August is the best time of the year to plant. So if you want to add a fruit tree to your garden, now’s the time for apples, pears, quince and medlars, also stone-fruit (plums, peaches, nectarines) and berries. 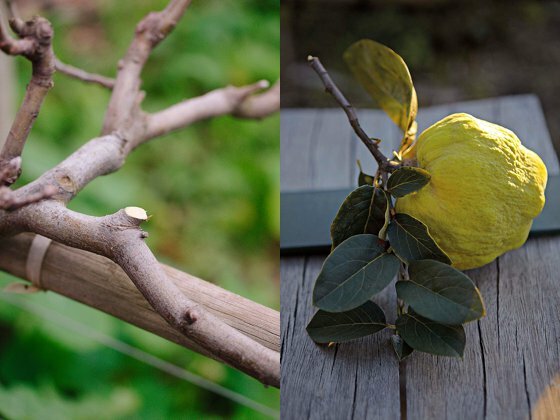 Draw your secateurs for apples, pears, quince, figs, roses, persimmons, berries and vines. ● To shape the tree (for the first three years) – a good, strong structure not only looks beautiful, it makes harvesting fruit much easier. ● Removing dead or diseased branches and open the inside of the tree for more light and air movement. This improves health. ● The right cut will stimulate new growth for future fruit. ● Thinning of fruit bearing branches will produce fewer, but higher quality fruit. Always use clean, sharp secateurs and a handsaw. Know thine tree. What species of fruit tree? Check when it’s in flower and when it bears fruit, so that you prune at the right time. 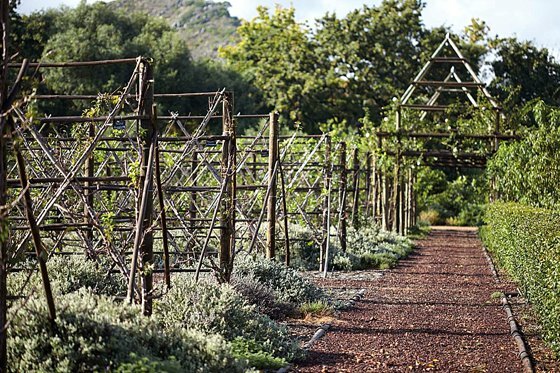 For example, Babylonstoren’s plums and almonds that blossom so sweetly now, were pruned about two months ago. Know on what type of wood it will bear fruit. We distinguish between “new growth wood” and “last year’s wood”. Figs, vines, guavas and quinces bear on “new wood”, i.e. this season’s growth. Prune these trees hard, to stimulate growth so as to produce more fruit. Apricots, almonds, nectarines, peaches, pears and apples produce on branches grown the previous year. Clip them more conservatively to remove dead, diseased or crossing branches, let the air in, space the fruit. I am fascinated by your quinces and medlars. Must join you on a tour as soon as possible. I would love to receive your latest news. Thank you.